With the passing of Association President Bert Hadley, during the last hour of July, the Austin Seven world has lost probably the last authoritative link with pre War Longbridge and Works racing and competition activities. Son of Herbert Senior, a toolmaker with Cadbury's, Bert was brought up in the Kings Norton district of Birmingham. In the tight-knit industrial areas of the West Midlands, most families had someone working for one of the famous manufacturers or suppliers. Bert did well enough at school to satisfy the stringent requirements of the Austin Apprentices' School and soon began his 'tour' of the various departments. Whilst keen to learn, the young Hadley gained a reputation for being a somewhat truculent little beggar which got him into (and out of) a few scrapes from time to time. The events which led to Bert's transfer to the prestigious Experimental and Competition Department are not common knowledge but it turned out to be a shrewd piece of man-management on the part of the Company. Suffice to say that for a decade, HLH had a hand in every Works competition car, and many of the pre-production prototype cars, which passed through the Department. In his time he was apprentice fitter, race car builder, test drive and eventually development engineer, after the death of Murray Jamieson almost put paid to the competition activities of the Works. Bert is probably best remembered for his tremendous contribution ti Works driver, rising to No 1 on both track and trials field. His ability as an engineer stood him in good stead and his judgement was shrewd: it was his suggestion, for instance, which led to the redundant Le Mans cars being turned to profitable use in trials. Thus was born the 'Grasshopper'. It is widely known that the Works competition activities in the mid to late 30's were not aided by a somewhat hostile management which the ailing Lord Austin was gradually losing control. The team depended on continued racing and trials successes for their existence. Bert's victories at the Craigantlet Hillclimb, the LCC Relay races, the Empire Trophy Donnington and many victories at Crystal Palace all played their part, as well as showing his versatility. The outbreak of the War in September 1939 put paid to many things, motor racing included. Had the War not intervened, it seems almost certain that Bert would have followed in the footsteps of British drivers and won a place as a professional with one of the great Continental Works Teams where his talents as an engineer/driver would have been recognised. Bert stayed on at Longbridge until 1941, being in a 'reserved occupation'. He had earlier tried to enlist in the RAF as a pilot but was turned down. However, on the personal intervention of Lord Austin who had played a major part in setting up the shadow aircraft factories, Bert was recommended to the Ministry of Supply and he settled down to become a civil servant. His brief was to cover the country, assessing the potential of companies to convert to vital war production, if necessary commandeering whole factories, and their work-forces; a considerable responsibility for someone with little managerial experience and who had just turned 30. In fact, Bert was to remain a 'Ministry Man' until his retirement in 1975. His last project was to set up Skill Centres throughout the West Midlands. He did race again, part time, from 1950 to 1955 driving for the Works teams of Jaguar, Healed, Gad and Triumph, mainly in long distance events such as the Mile Milia, Le Mans, the Tourist Trophy and record breaking. One exploit was the night-time blast in the Jaguar 120 on the new but un-opened Jabbeke motorway, between Ostende and Brussels which achieved a two-way average of 120 mph! In more recent times, he renewed his interest in the vintage and classic scene, particularly the resurrection of the Austin ex-works cars. It was a considerable disappointment that he never heard 'his' Twin Cam running again, particularly as he had personally re-built the gearboxes and superchargers to race standard for both surviving cars. He always felt that petty politics and chicanery dictated otherwise. As a lifelong member of the BRDC, he had an open door to their Silverstone Hospitality suite but whilst acknowledging the skill and bravery of the drivers, he disliked the media hype and hangers-on which are such a large part of modern motor sport, preferring the competition at club level, especially Austin 7 and vintage racing more to his taste. He was often to be found at Mallory for 750 MC events and at Silverstone and Shelsley Walsh for VSCC meetings. Always the bluff 'Brummie', he never suffered fools gladly, was a shrewd judge of character, developed over many years of interviewing people in a variety of situations. 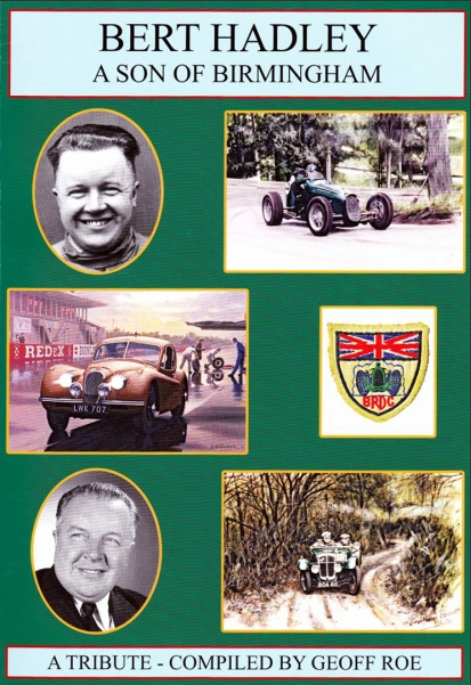 His writings on Austin matters were priceless to the student of motoring history. His memory held up well but if he could not a name to a face on a 60 year old photo, he'd say so and not invent one. Many an editor, myself included, have been grateful for his knowledge and willingness to put pen to paper. Sadly, though many of his memories have been recorded in various Austin 7 publications, many more anecdotes of captains of industry, racing personalities and the large number of ordinary and extraordinary characters he encountered over the years have not. Hopefully his many friends in the Austin 7 movement will be able to put together some of their memories and preserve some of these stories. Bert became President of the Association in 1990 but his connections with the movement go back much further. He presented a trophy to the 750 MC in 1981 for A7 racing some 10 years after he first met Ken Cooke: I met Bert in 1977 during the first 10,000 miles record attack. The following year, he was on hand once more to see our progress and kindly wrote the article which appears in the Association Magazine 1978D. He was unable to take as great a part in Association activities as he would have wished but he had not been at 'full power', as he would put it, since the death of his wife Rose who he missed greatly. He died peacefully at Leamington Spa and we offer our condolences to his son Clive and his family.